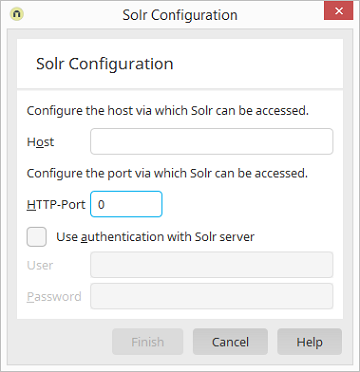 Setup Welcome dialog Installation packages / Click on "Next" Select/enter installtion path / Click on "Finish" Installation summary / Click on "Apache Solr configuration"
Enter the host for the Solr server here. Enter the HTTP port that can be used to interact with Solr here. The user and password needed to log in to the server can be entered here. Applies the selected options and closes the dialog. You will be returned to the installation summary dialog. Closes the dialog. Changes are not applied.